The economy added 200,000 jobs in September, according to ADP. This is bang in line with the Street estimate for payrolls on Friday. Note that the initial reports of late summer payrolls seem to consistently miss on the downside and are usually revised upward in subsequent months. Mortgage Applications fell 6.7% last week as purchases fell 5.6% and refis fell 7.5%. The ISM Milwaukee index fell to 39.44 from 47.7 last month. The Chicago Purchasing Manager Index fell to 48.7 from 54.4. The strong dollar is taking its toll on manufacturers. All cash sales dropped to 31% in June, according to Corelogic. The historical, pre-bubble average is close to 25%. This speaks to the lack of first time homebuyers. It also speaks to an increase in gettable loans as that number reverts to the mean, even if home sales remain flat. One of the big questions facing the Fed concerns falling unemployment and a falling labor force participation rate. Intuitively, you would think that as unemployment falls, people who are not currently in the labor force but want to be would find jobs, which would push up the participation rate. If the labor force participation rate remains low, that means the potential growth of the economy remains low, which means a slow, plodding recovery that won’t feel like any sort of economic boom. It also means inflation should, at least in theory, come back as companies bid up the wages of the fewer workers that are left. So far we aren’t seeing that. Millennials should be picking up the slack of retiring boomers but so far it hasn’t happened. And if Millennials don’t do it, then you need to pick up immigration. Elizabeth Warren is mad that the government is selling distressed mortgages to hedge funds and private equity firms and wants them sold to non-profit firms. She is of the opinion that hedge funds and private equity firms pursue foreclosure too quickly and said “The heart of it is these loan sales need to come with strings attached with basic outcomes for homeowners.” She is either posing for the cameras or completely uninformed: They do come with strings attached. You usually cannot foreclose for at least a year and must hold the loans for a period of several years. Heading into campaign season, Americans’ trust in the media is at an all time low. We have some important data this week, with construction spending, the ISM data and the jobs report on Friday. The market is forecasting a jump in wage inflation and that will be the number everyone is going to focus on. Personal Spending rose 0.4% and Personal Income rose 0.3% in August. Inflation came in at 0.1% month-over-month and up 1.3% year-over-year. Pending Home Sales fell 1.4% in August, but are up 6.7% year-over-year. The Dallas Fed Manufacturing Index came in less negative than forecast. On Friday, Speaker of the House John Boehner announced he was resigning. At the margin, it probably means a clean continuing resolution (in other words, no government shutdown). This isn’t going to matter to the markets one way or another – they recognize government shutdowns and debt ceiling fights as what they are: a chance for politicians to posture, and otherwise something to ignore. The favorite to replace Boehner is Kevin McCarthy from California. Speaking of government shutdowns and the debt ceiling, it does have an effect on the bond markets. The debt ceiling’s proximity means the government has to issue less T-bills than it ordinarily would, which makes them scarce and therefore they have ultra-low interest rates. This is bad news for money market funds and other savers. That said, ZIRP is the primary reason the issue. Markets are higher this morning after Janet Yellen soothed concerns over global growth and said the Fed is probably still going to raise rates this year. Bonds and MBS are down. I see a headline coming across the tape that House Speaker John Boehner is going to resign from Congress, according to the New York Times. Don’t see anything on the NYT site, but if so, this is big news. The third revision to second quarter GDP came in at +3.9%. Personal consumption was revised upward to 3.6% from 3.1%. Inflation remains more or less at the Fed’s target rate of 2%. 3Q GDP forecasts are much lower, in the 1% – 2% range. Consumer sentiment slipped in September, according to the University of Michigan. This is the lowest reading in a year. Janet Yellen spoke yesterday, and said the Fed will probably still raise rates this year, however they were willing to let the labor market run hot for a while. The markets were cheered by these statements. She mentioned getting discouraged workers back into the workforce, and that is somewhat new – historically, they have focused on unemployment and wage inflation. Here is a deeper dive into what she was talking about. Interestingly, the Fed thinks that early on ZIRP had little to no effect on the economy, and that only now, are we starting to see the economic benefits of ZIRP. 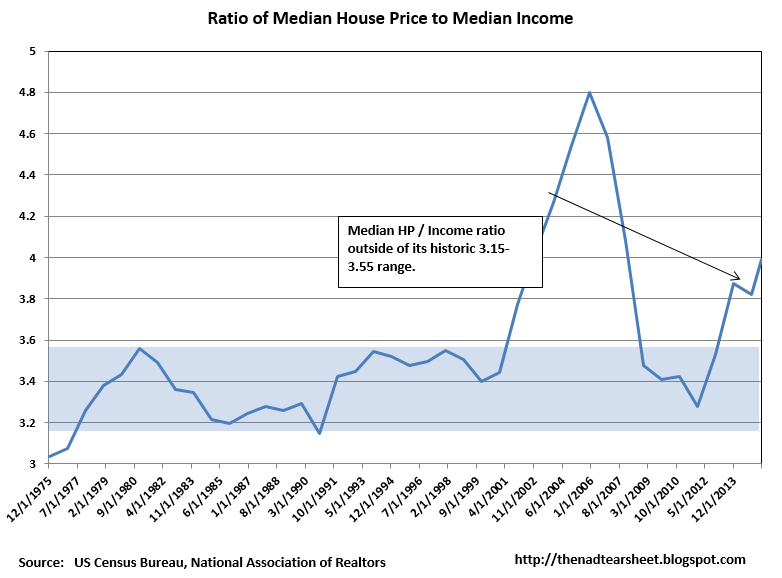 IMO, it has always been about real estate prices. 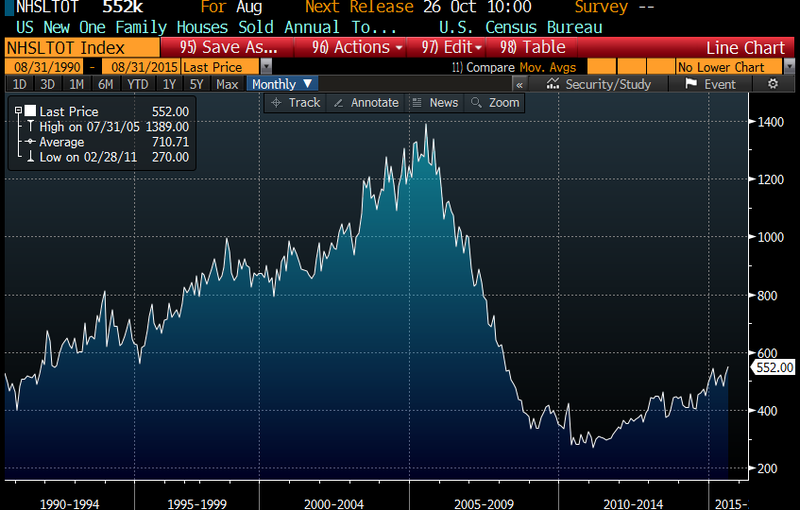 Once real estate bottomed in 2011 / 2012 the economy began a more robust recovery. Markets are lower this morning after Caterpillar warned and announced it will cut 5,000 jobs. Bonds and MBS are up. Durable Goods orders fell 2% in August, coming in better than estimates. Capital Goods Orders (a proxy for business capital expenditures) fell 0.2% versus expectations of 0.5%. The Chicago Fed National Activity Index slipped in August from 0.51 to -.41. This index has had one positive reading all year. Initial Jobless Claims came in at 267k. The Bloomberg Consumer Comfort Index fell to 41.9. Builder KB Home reported better than expected earnings this morning but disappointed on orders. Orders were up 19% to 2,167 units. Backlog increased 36%. Average selling prices rose 9% to $357.2k from $327k. The stock is down about half a buck on the open. Holiday retail sales are expected to increase 3.5% – 4% this year, a deceleration from last year’s 5% pace. Given all the somewhat weak data, Q3 and Q4 GDP are looking a little soggy. Yet another excuse for the Fed to stand pat. Markets are flattish this morning on no real news. Bonds and MBS are down small. Mortgage Applications rose 13.9% last week, with purchases rising 9.1% and refis rising 17.7%. Refis increased to 58.4% of all loans. This was the first full week after the Labor Day holiday, so don’t break out the champagne quite yet – the increase was due to a holiday-shortened week before. Mario Draghi (European Central Bank President) said more time is needed to assess whether more stimulus is needed. Bill Gross wrote about financial repression (essentially having rates pegged at the zero bound) and the risks it poses to the financial system. He makes the point that pension funds are getting hammered because they cannot generate the required return on assets with safe assets so they are taking more and more risk, citing municipalities like Chicago, Detroit, etc. He argues that we should be willing to take some short-term financial pain for longer term financial stability. Of course Dr. Cowbell has a different take, which is that bankers want higher rates because they hate poor people and want them to suffer. Or something. Now that Scott Walker has exited the race, it looks like his money and staffers are going to Marco Rubio. Has ATR and HMDA restricted mortgage credit? Not according to the Fed. Probably because credit has been highly restrictive since 2008. It couldn’t have gotten any tighter to begin with. Note that QM was intended to make lender more likely to lend. Given what we have seen with the big banks exiting FHA (Wells and Chase), the CFPB’s new rules aren’t having the desired effect. Stocks are lower this morning on overseas weakness and slumping commodity prices. Bonds and MBS are up. House prices rose 0.6% in July, according to the FHFA. They are now within 1.1% of their March 2007 peak. The Mountain states performed the best, while the Northeast performed the worst. The Richmond Fed Manufacturing Index fell in September. The strong dollar is hurting manufacturing. Scott Walker dropped out of the Republican presidential campaign yesterday. His staffers went to the Rubio campaign, which tells you how the pros are reading the tea leaves with respect to the Republican presidential nomination. Housing affordability is the lowest since 2008, as the median house price to median income ratio becomes stretched again. Affordability peaked between 2011 and 2013, however professional investors were the ones in a position to take advantage of it. Credit conditions continue to improve, but are still a fraction of what they were pre-crisis. The big banks are backing away from the FHA market, citing regulation and worries about giving loans to 520 FICO borrowers who only put 3.5% down. Separately, Ginnie Mae is worried about the fact that small independent mortgage bankers are filling the void left by the big banks. The industry is concerned that the big bank withdrawal is hurting the housing recovery.